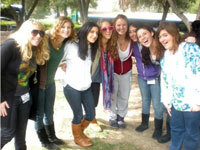 We’re preparing documentation for numerous ways for alumni to engage with their LA Hebrew High community. From volunteering on campus or speaking at Jewish community events to being brand ambassadors and doing PR for our organization. Ideas/thoughts? Please email Administration@lahhs.org and we will be quick to respond!